As the national Wine Sponsor of the Swirl series, we are incredibly inspired by the series’ tremendous success and the impact our partnership has on the lymphoma community. The Lymphoma Research Foundation (LRF) – the nation’s largest non-profit organization devoted exclusively to funding innovative lymphoma research and serving the lymphoma community through a comprehensive series of education programs, outreach initiatives and patient services – hosted the sixth annual Swirl: A Wine Tasting Event series in Miami Beach on March 19. 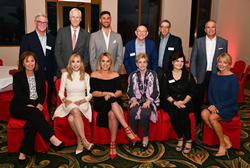 Returning to the La Gorce Country Club, the event raised more than $85,000 in support of the Lymphoma Research Foundation and its mission. Representatives from National Wine Sponsor Southern Glazer’s Wine & Spirits (SGWS) were on hand to present attendees with a selection of award-winning wines that featured Hot Wine Trends of 2019, highlighting emerging wine trends from lesser known countries and appellations. More than 150 guests attended the evening’s unique wine tasting and silent auction, bringing the total amount of funds raised since the inception of Swirl: Miami to more than $365,000. Due to the success of Swirl: Miami, the Foundation is one step closer to achieving $1 million raised through the Swirl: A Wine Tasting Event series. To celebrate the upcoming milestone achievement and to honor national Wine Sponsor Southern Glazer’s Wine & Spirits partnership and commitment to LRF’s mission, the Foundation will present their coveted philanthropic Hope Award to SGWS at Swirl: Chicago on May 30. LRF Board member, steadfast supporter of the Foundation’s Swirl series and Executive Vice President of Commercial Operations at Southern Glazer’s Wine & Spirits Kevin Fennessey will be in attendance to accept the award. National Swirl series sponsors include Wine Sponsor Southern Glazer’s Wine & Spirits; Presenting Sponsor Genentech; Platinum Sponsor Kite Pharma, a Gilead Company; and Gold Sponsors AbbVie, and Verastem Oncology. Nina and Walter Andrews, Debbie and Kevin Fennessey, Barbara and Jerry Freundlich, Midge and Mark Halpern, Leigh and Cory Olson, and Florence and Robert Werner served as the evening’s Host Committee. Leigh and Cory Olson are also the Premier Sponsor for Swirl: Miami. For more information about Swirl: Miami, visit lymphoma.org/SwirlMiami. The Lymphoma Research Foundation (LRF) is the nation’s largest non-profit organization devoted to funding innovative research and serving the lymphoma community through a comprehensive series of education programs, outreach initiatives and patient services. To date, LRF has awarded more than $62 million in lymphoma-specific research. For additional information on LRF’s research, education and services, visit lymphoma.org.